By Daniel Parnell, Peter Millward, Paul Widdop, Neil King and Anthony May. Austerity is perhaps the major challenge of our times, given the speed at which it arrived and the consequences of its impact upon society. The global financial crash and economic downturn was the catalyst for change and, against a backdrop of advice from experts adverse to Keynesian economics, the ideology of austerity grew and became the dominant thinking to steer economies out of recession. This comprehensive volume draws upon both quantitative and qualitative research methodologies to provide a varied and contextually rich insight into sport, policy, and politics in an era of austerity. The authors cover a wide range of issues in a variety of organisational contexts and geographies, including sports participation across different socio-demographic groups; the impact of austerity on the provision of community sports; disability sport; public management of sport facilities; the performance of public sport facilities with respect to access, finance, utilisation, and customer satisfaction; the potential impact of austerity on sport for development; elite sport; and social inclusion and poverty. This book makes a significant contribution to the current academic debate, while raising important considerations for policymakers and managers. It was originally published as a special issue of The International Journal of Sport Policy and Politics. 5. The Routledge Handbook on the Business of Football. Soccer is the world’s most valuable sport, generating bigger revenues, as well as being watched and played by more people, than any other. It is virtually impossible to understand the business of sport without understanding the football industry. This book surveys contemporary football in unparalleled breadth and depth. Presenting critical insights from world-leading football scholars and introducing football’s key organisations, leagues and emerging nations, it explores key themes from governance and law to strategy and finance, as well as cutting edge topics such as analytics, digital media and the women’s game. This is essential reading for all students, researchers and practitioners working in football, sport business, sport management or mainstream business and management. It is a common assumption that sport is good for us and that participation in sport embodies public health benefits. With sport being increasingly used to deliver public health interventions worldwide, this book critically examines the rationale and evidence for sport as a public health policy tool. Featuring contributions from the United Kingdom, United States, Europe and Australia, it sheds new light on an emerging field of research which has significant implications for public health across the globe. Each chapter looks at the effectiveness of sport interventions across the lifespan for biological, psychological and social benefits, including those that utilise a settings-based approach to health promotion such as schools and professional sport clubs. Drawing on cutting-edge research which examines policy and practice at community and elite levels, this book addresses key topics such as education, engaging children and young adults, mental health, sport sponsorship and volunteering. 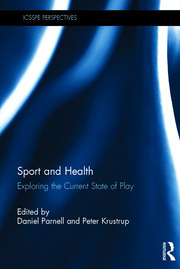 Sport and Health: Exploring the Current State of Play is important reading for all students, scholars and policy makers with an interest in the sociology of sport, physical activity and public health. 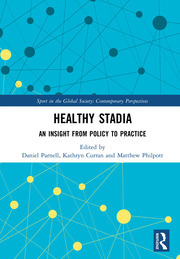 This book outlines lessons and insight from practitioners and empirical research for those seeking to learn and research stadia as a settings approach to health promotion. The areas covered include: practical considerations for health promotion in sports stadia; empirical research on the sports stadia as a setting for public health promotion; research on physical activity and health promotion programmes delivered by the outward facing community trusts attached to sports clubs; an analysis of the policy considerations for health promotion by sports clubs in school based settings and critical insight and discussion surrounding the use of physical activity and sport interventions to promote physical activity and public health. The chapters in this book originally published in a special issue ofSport in Society. There is developing interest in the use of sporting settings as a channel to connect people to health improvement services and an emerging body of research highlights football as being associated with positive motivational and social elements that support the maintenance of a physically active lifestyle. This text provides insights into a range of issues surrounding the role of football as a vehicle for health improvement for different groups. The contributors to this volume share some of the challenges and the benefits of using professional football settings as a channel for connecting people to health improvement opportunities. These chapters will be of interest to a range of stakeholders involved in research, policy and practice who stand to benefit from building partnerships with colleagues with expertise in (I) conducting evaluation and (II) reporting evaluation and research outcomes in peer-reviewed mediums, reflecting the value of partnerships between football-led health improvement and evaluators. This book was previously published as a special issue of Soccer & Society. This book explores the current role of a football and football clubs in supporting and delivering social inclusion and health promotion to its community and seeks to examine the philosophical, political, environmental and practical challenges of this work. 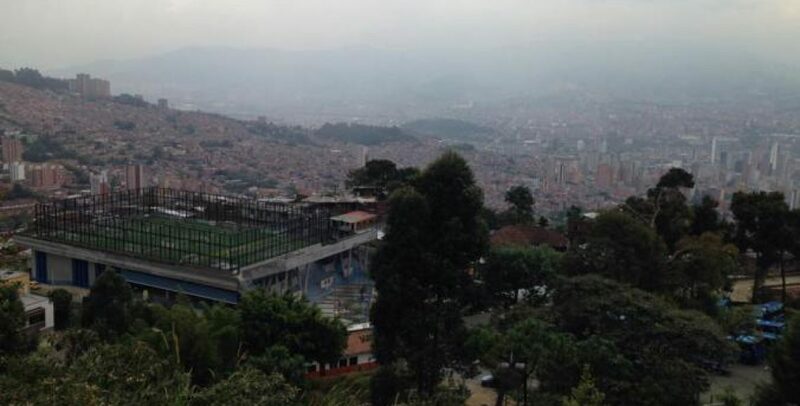 The power and subsequent lure of a football club and its brand is an ideal vehicle to entice and capture populations that (normally) ignore or turn away from positive social and/or health behaviours. The foundations of such a belief are examined, outlining key recommendations and considerations for both researchers and practitioners attending to these social and health issues through the vehicle of football.